The Global Policy Forum will begin in Yaroslavl in approximately one month from now under the auspices of the President of the Russian Federation, Dmitry Medvedev. This year, participating politicians and experts are invited to take part in discussions on the issue “The modern state in the age of social diversity”. There are several important questions with regard to the Forum: What is the current reputation of the Forum after several years of its existence? How do those who have previously taken part in the Forum evaluate it today? How is it possible to improve the approach taken in terms of debates at the Yaroslavl Forum? These and many other questions are answered by: Vladislav Inozemtsev, the Head of Executive Directorate of Global Policy Forum; Gleb Pavlovsky, Member of the Global Policy Forum Council and President of the Russian Institute; Vyacheslav Nikonov, President of the Polity Foundation and the Executive Director of the Unity for Russia Foundation, who is the Russian moderator of the Forum section “Democratic institutions in multi-ethnic societies”; and Efim Pivovar, Dean of the Russian State University for the Humanities. The following foreign participants also provided their assessment of the previous forums, as well as their recommendations for the future Forums: Richard Sakwa, an expert in the field of Russian and Eastern European politics and Professor at the University of Kent (UK); Anatol Lieven, Senior Researcher at the New America Foundation (Washington, USA); Adrian Pabst, researcher and Lecturer in Politics at the University of Kent (UK); Gerhard Mangott, Professor of Political Science at the University of Innsbruck (Austria); Joachim Krause, Director of the Institute for Security Policy at the University of Kiel (Germany); Martin Bruzis, Managing Director of project network “Institutions and institutional changes in post-Socialism” (Munich, Germany); and Peter Schulze, Professor of Political Science at Georg-August University in Gottingen (Germany). 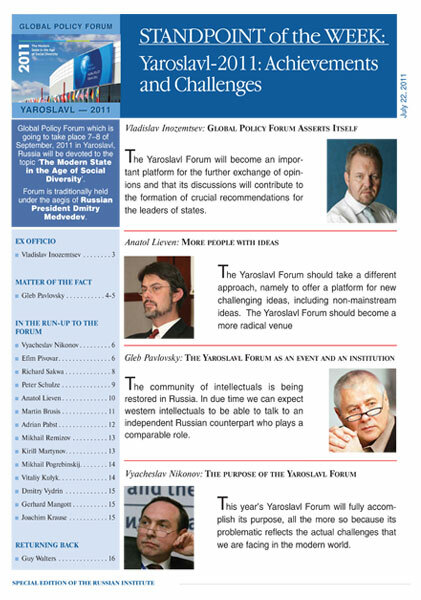 The way that the Global Policy Forum is perceived in the post-Soviet sphere is related by several political scientists from Kiev: Mikhail Pogrebinskij, the Director of the Kiev Centre of Political and Conflict Studies; Dmitry Vydrin, Director of the European Institute for Integration and Development; and Vitaliy Kulyk, Director of the Centre for Research on Civil Society Problems. The future agenda of this year’s Forum is discussed by Mikhail Remizov, who participated in the preparatory meeting of the Forum in China, and Kirill Matynov, Editor-in-chief of the Mnenya.Ru website.